about this boxed set: Dark magic, heroic Knights of Death, and a daring adventure to save the world! This mind-bending journey starts in Book One, "Willow of Ashes," when an apprentice reaper named Xavier vanishes into the ocean and his soul ends up trapped inside his twin brother. The co-existing necromancers surface up to the Land realm to begin a search for Xavier's missing body, only to discover this realm is infested with an army of soul-devouring demons. In Book Two, "Orbs of Azure," the quest for Xavier's body is put on hold yet again as tensions between the reapers and Land realm escalate into full-out war. 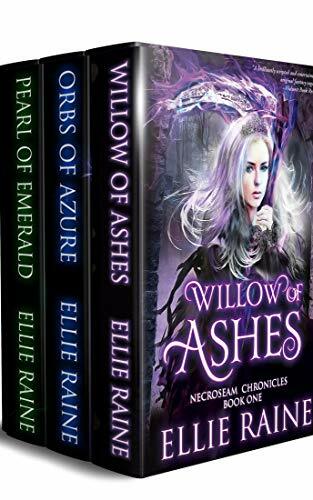 When their comrades are taken captive, the twins join Death Princess Willow on a rescue mission, encountering important allies from all five realms, all of whom are searching for a legendary hero named "Shadowblood"... someone who looks just like the twins, if they had been born as one. The saga continues in Book 3, "Pearl of Emerald". After six years trapped inside his twin, Xavier's soul is finally back in his own body. Now the brothers must accept their destiny, for the seers of this world have foreseen both twins are the chosen champions of the world. If only they knew what that meant! The NecroSeam Chronicles takes the classic lore of the Grim Reaper and braids it into a thrilling adventure full of whimsy, wonder, and just a dash of horror. A unique and enchanting fantasy of magic, brotherhood and mystery that will take readers on an epic journey they won't soon forget!